Today’s real estate headlines are full of questions and declarations about Las Vegas’ tremendous home price growth over the past year. The widely followed S&P/Case-Shiller index is up 12.4% year-over-year (measured in March due to reporting lag) while the median single family home has risen by eighteen percent (measured in May). This price velocity is fascinating, however, the real estate market is a market of many markets since housing is heterogeneous and spatial in context. Not all housing types are rising at the levels illustrated by the broader indices. Unknown by most index users, S&P/Case-Shiller has a tiered index set which divides the market into three principal tiers, a low, middle and high price. Of the overall price index increase, much of that is due to the middle and low price tiers. The low price tier has been rising at about 18% year-over-year while the middle tier has risen 14%. The high tier rose by 9%, so half of what was measured in the low tier. For casual observers, this is contrary to many predictions that higher-end homes should go up in price faster than the more affordable ranges. To those that are house hunting anywhere around $300,000 or less, they know very well that the lower priced homes are going up in price very fast, primarily due to low inventory and some relatively strong demand. The key observation is that while the high tier has lagged in recent performance, the overall volatility is much less. Generally this is what we observe for homes between $300,000 and $600,000, however, on the luxury portion of the pricing spectrum, a shallower and more discerning buyer pool invites some price volatility and the variations in comps requires much more gut level judgement from owners and buyers. 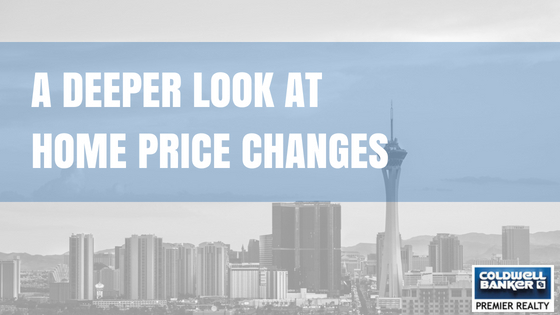 Lastly, price changes vary substantially by location. The map below shows increases between the recent quarter and the same quarter one year ago. Where a lot of the dark blue is concentrated, homes tend to be smaller, older and much more affordable, so relative to what we see in the price indices, this has intuitive appeal. Despite the general pattern making sense, we see pockets of large increases in prices so you can see there is substantial variation and potentially, this is due to variation within the two samples, reinforcing our point that homes can be priced on a hyper-local basis. In the end, we caution that the headlines may not match your own experience and that professional advice with regard to potential sales is very important.